Don’t need a delivery? Your welcome to pick up any of our bulk products during business hours. Stop in at the office and someone from our well trained staff will load your truck or trailer. 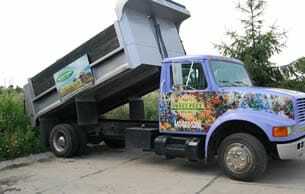 A regular size pick-up will hold 1-2 cubic yards of mulch or 1 ton of gravel, soil, or sand. Safety first, be aware of what your vehicle can legally hold. Royalton Supply delivers Monday through Saturday in the following areas (but not limited to). You do not have to be present for a delivery, but pre-payment must be made and a designated area in the driveway is required. Deliveries are made Monday through Saturday during business hours. We will call first before arriving at your location. Please Note: Royalton Supply is not responsible for damages incurred to driveways, houses, garages, auto, lawn & landscapes, utility wires, basketball hoops or any other objects located at delivery location. Choose where you would like to have the product placed in your driveway, then take a look around to see if our trucks can get too and operate in this area. Remember the bed of the truck will need to extend up for us to make the delivery. We prefer to deliver products to your driveway. Please realize that if it has been raining or the ground is soft the driver will not take the load off of a hard surface. This is to insure that you will not incur a tow bill should the truck become stuck. Our trucks are heavier than your car and that’s before any product is loaded into them. Please fill out this form to request pricing or a delivery quote and we will contact you within 24 hours. All information will be confidential.